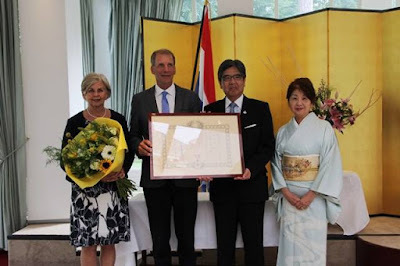 Yesterday (12 June), a special ceremony took place at the residence of Ambassador Inomata to confer the “Order of the Rising Sun, Gold and Silver Rays” upon Mr. Hans de Wekker, the former president of the Kyudo Renmei Nederland (Dutch Kyudo Federation; “Kyudo” is Japanese archery). 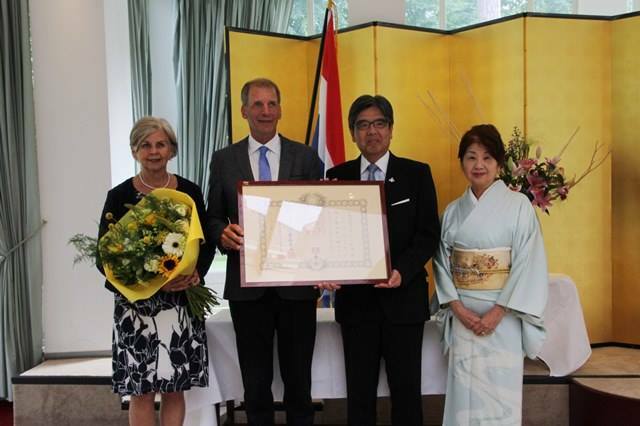 Ambassador Inomata delivered a congratulatory speech and presented Mr. de Wekker with the decoration as well as a framed patent. Mr. de Wekker, who has received the decoration for his contribution to promoting Kyudo in the Netherlands for a long time, was invited onto the stage to say a few words to the family members, friends and representatives from the Budo and cultural communities that had all gathered for this special moment. After speeches by Mr. de Wekker’s wife and by a good friend, a toast brought the official ceremony to an end, after which the guests could enjoy the reception.